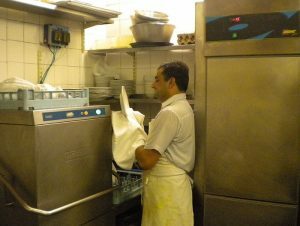 Man operating a large dishwashing machine in a restaurant. Source: Wikimedia Commons. Photographer: Khalid Mahmood. License: Creative Commons Attribution-ShareAlike 3.0 Unported. The image has been cropped.